R.C. Worst & Co., Inc. has been building pumping system packages for over 35 years. Back in 2001, we finally decided to give these assembled products a name, Automated Flow Systems, or AFS for short. From large municipal lift stations, to pump discharge assemblies, AFS systems are providing complete solutions or R.C. Worst & Co. customers with great success. Automated Flow Systems (AFS) Packaged Lift Stations include a complete fiberglass reinforced polyester (FRP) wet well and valve vault assembly (as applicable) to provide a functioning lift station with minimal installation time and cost. 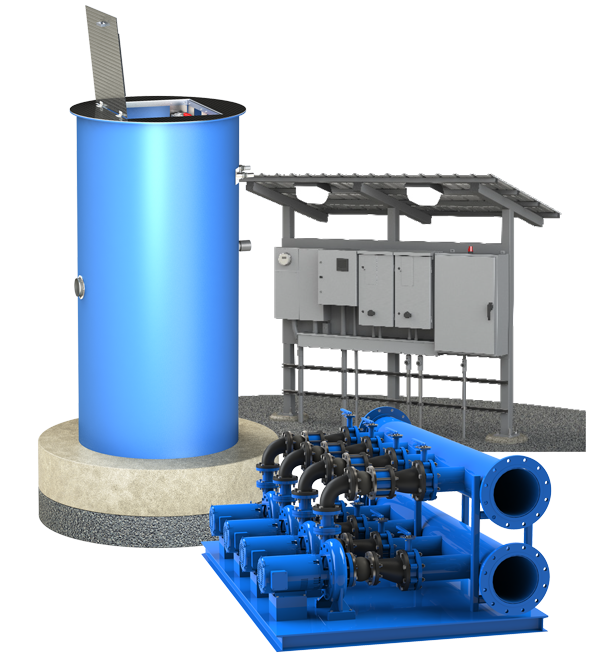 The wet well assembly includes pump slide rails, discharge piping, and other hardware such as floats, transducers, and electrical junction boxes installed. The valve vault assembly includes discharge manifold, valves, ladder, and any other accessories. The pumps and controls are shipped separately but prepped for installation with slide rail couplings, lifting cables, and electrical cable strain reliefs installed to expedite field installation. 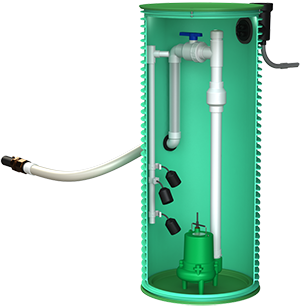 Residential pump basins often take the place of the noisy, smelly, messy, and difficult to service pump tank units that are located inside a home. By placing the pump tank outside the home and near the foundation, the pumping equipment is accessible and away from living areas whereby making our pump basins a desirable solution. Combined with a control panel that includes a high water alarm, the higher volume external basins provide a much more reliable solution. We can even equip, provide or install duplex pumping units to provide redundancy in case of pump failure. Using modern materials and methods, R.C. Worst & Co., Inc. can add value to your building project or existing home upgrade. Either by improving the accessibility of your septic tank by adding an AFS PVC riser, or by making your soils "acceptable" by providing our continuous flush drip head-works, we would like to help you make life easier by providing reliable solutions to your on-site pumping and disposal problems.